The Kidde SL177i (SL177) is a 120VAC wire in unit that provides a visual warning when part of an interconnected system. This unit can be directly interconnected with Kidde smoke alarms, heat alarms and carbon monoxide alarms (a maximum of 24 devices of which 18 can by initiating). When triggered by a smoke alarm or heat alarm, it will produce a steady flash warning. When triggered by a carbon monoxide alarm it will produce an intermittent flash warning. The SL177i has a 5 year limited warranty and is UL Listed. ATTENTION! 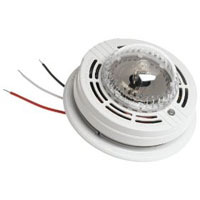 The model SL177 and SL177I strobe lights are designed to notify hearing impaired individuals of impending danger, they have no detection means and MUST be used in conjunction with operating Smoke, Heat, or Carbon Monoxide Alarms. The Kidde SL177i, used in conjunction with a smoke, heat or carbon monoxide alarm, provides a bright visual signal to warn of a smoke, heat or CO hazard. The Kidde Strobe light benefits the hearing impaired, allowing a visual alert of a danger. This unit also includes a tamper resist pin that helps to deter thief and tampering.